Imagine traditional congregations in the United States and Canada sending missionaries across the street from their church buildings to express the kingdom of God within a postmodern culture and among disenfranchised Christians. The possibilities and potential are endless. This concept is explored and actual examples are presented in Street Crossers. Partnerships between traditional churches and nontraditional “simple church” planters are rare. More need to be encouraged because a significant number of people across North America are skeptical of organized religion or want nothing to do with church-as-usual. While some might conclude that the traditional church has little to offer a postmodern world and that no amount of tweaking traditional church structures will make a significant difference, they have forgotten to consider a vital reality existing in most congregations across the land: a commitment to send and support missionaries to “foreign” cultures. It's time to harness this existing commitment and focus it across the street. Rick Shrout has spied hopeful signs of church and gospel touching postmodern U.S. culture. And he has found them in unexpected places—traditional churches and non-traditional “simple church” missionaries joining hands instead of trading critiques. This is no mere theory, but real stories of God using such partnerships to bring Christ to U.S. neighborhoods. This book is just what is needed as those within traditional church leadership continue to explore how they can help or where appropriate embrace the work of those called to simple/organic church planting initiatives. By looking in depth at four specific situations, and interviewing the people involved, Rick has given us a valuable roadmap that clarifies some of the blessings and some of the challenges people will face in moving from traditional to simple, rapidly multiplying models of church. 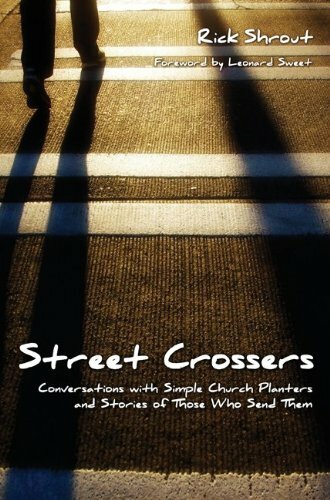 Rick Shrout’s “Street Crossers” gets at the heart of what it means to be a missionary in today’s post-modern culture. He reminds us that there are mission fields across the street from our homes, in our neighborhoods, just around the corner. We don’t need to travel to a third-world country to be a missionary. Rick’s passionate call to his readers calls us to realize that streets lead to connections but at the same time also to disconnections. We are challenged to “cross the street” because that is where we will find Jesus. Dr. Jay A. Barber, Jr.